With a foreword by Roméo Dallaire and an introduction by Carol Off.No journalist has reckoned with the psychology of war as intimately as David Finkel. In The Good Soldiers, Finkel shadowed the men of the US 2-16 Infantry Battalion in Baghdad as they carried out the grueling fifteen-month "surge" that changed them all forever. 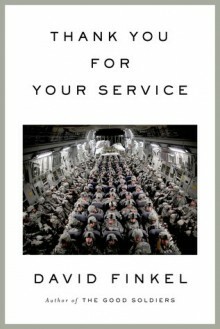 Now Finkel has followed many of the same men as they've returned home and struggled to reintegrate - both into their family lives and into society at large.In the ironically titled Thank You for Your Service, Finkel writes with tremendous compassion not just about the soldiers but about their wives and children. Where do soldiers belong after their homecoming? Is it reasonable, or even possible, to expect them to rejoin their communities as if nothing has happened? And in moments of hardship, who can soldiers turn to if they feel alienated by the world they once lived in? These are the questions Finkel faces as he revisits the brave but shaken men of the 2-16.More than a work of journalism, Thank You for Your Service is an act of understanding -- shocking but always riveting, unflinching but deeply humane, it takes us inside the heads of those who must live the rest of their lives with the realities of war.